The Greater Niagara region has been a hot spot for travelers for a loooong time. After all, if Niagara Falls isn’t on your bucket list, you probably don’t have a bucket list. The region is also full of art, culture, history, flora-and-fauna-and-Americana, and signature sandwiches oozing with flavor. You’re about to find out that this region is much more than waterfalls and wings—but definitely get in on both of those during your visit! More to Niagara Falls than you knew! Niagara Falls is one of the most famous waterfalls in the world and has delighted families and honeymooners (like Pam and Jim from The Office) for centuries. But did you know that it was actually the first state park in the country, established in 1885? Or that 75,750 gallons of water flow over the American and Bridal Veil Falls every second? Or that the first person to go over the Falls in a barrel was a 63-year-old female teacher in 1901? Don’t try this today—it’s not safe and it’s illegal. 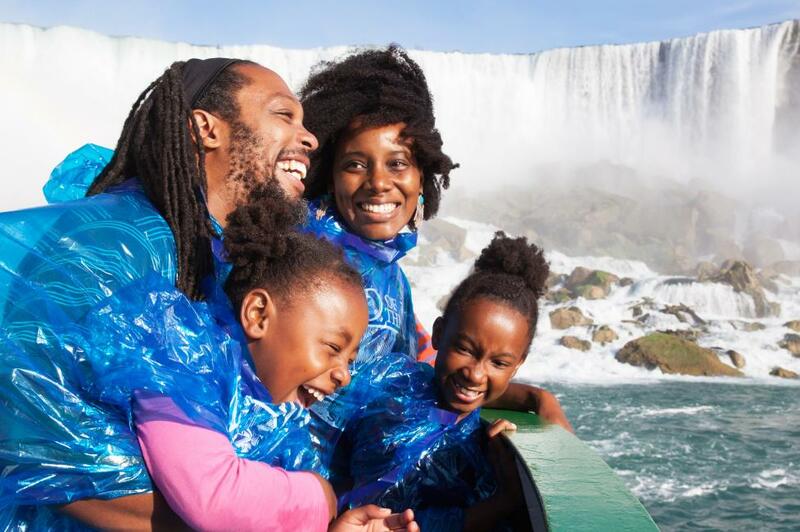 Instead, experience the falls on a Maid of the Mist boat tour, winner of the 2019 I LOVE NY Bracket. You’ll get so close that you’ll feel the powerful sprays yourself, which is why you’ll be provided with a poncho. 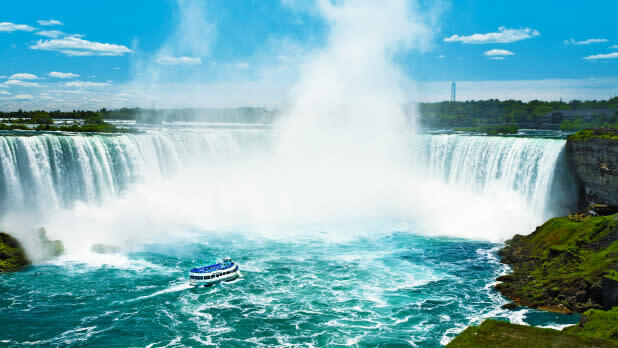 Or get face-to-face with Bridal Veil Falls on a Cave of the Winds tour as you take an elevator down 175 feet into Niagara Gorge and approach the rushing Falls via wooden walkways. A steam engine ride through the countryside! If you have a hard time walking across your living room without stepping on plastic train tracks, your family’s going to love an excursion on the Arcade and Attica Railroad. 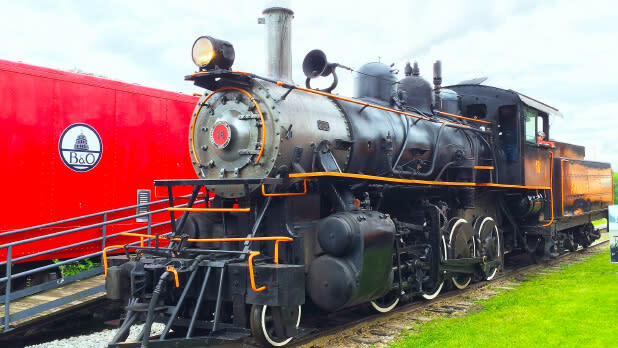 A&A Railroads provides rides on some of the only steam locomotives in New York through Wyoming County—passing through woods and open fields, with a few babbling brooks thrown in. From seasonal rides like Maple Weekend Excursions and North Pole Express trains to themed rides like the Civil War or World War II (with military displays, reenactors, and demos) or a Murder Mystery Dinner train, you’ll be on the right track. A famous sandwich in a recycled silo! 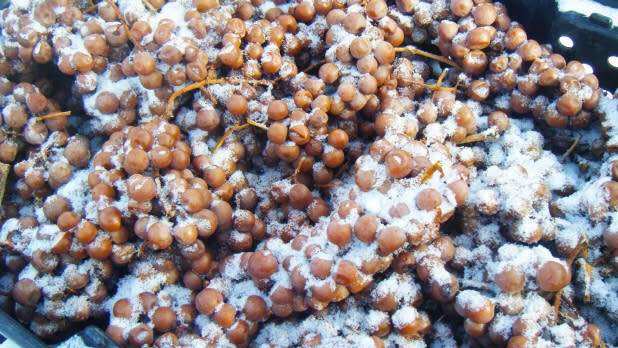 Wine made from frozen grapes! Niagara Falls isn’t the only natural feature of this region that appears frozen in the winter—it’s also the grapes! The cold temperatures along Lake Ontario and around Niagara Falls cause the water in grapes to freeze, while the sugar inside stays liquid and ultra-concentrated, which is then turned into a refreshing, sweet, dessert wine. Try the Vidal Blanc Ice Wine at Niagara Landing Wine Cellars or Leonard Oakes Estate Winery or the Block Three Ice Wine at Schulze Vineyards & Winery along the Niagara Falls Wine Trail. The chance to take a selfie with a shark! The Albright-Knox Art Gallery in Buffalo has been collecting and exhibiting art for more than 150 years and boasts pieces by Matisse, Picasso, Kahlo, and O’Keeffe. Since 2013, the Public Art Initiative associated with the gallery has commissioned new pieces all over the area, with the goal of creating stronger neighborhoods through inclusive public art programming. Look for Wildflowers for Buffalo, a beautiful floral mural by Louise Jones on the side of the Sinclair Building. 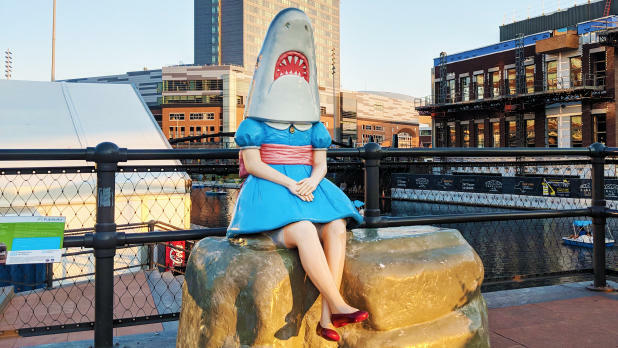 You’ll find Casey Riordan Millard&apos;s Shark Girl, a girl in a dress with a shark head sitting on a rock at Canalside, who has become a popular selfie star. The rest are yours to discover! Nature trails without a closing time! The Buffalo Audubon Society protects more than 1,000 acres of land in Western New York. At Beaver Meadow Audubon Center in North Java, the public can access eight miles of trails all day, every day. Stroll through wooded uplands and meadows, walk across ponds and wetlands, and keep an eye out for hawks. 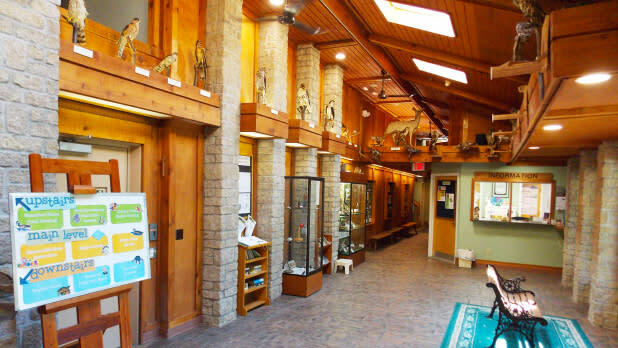 There’s also a nature center (not open 24/7) with exhibits, wildlife observation windows, a nature library, a children’s discovery room, a gift shop, live amphibians, and more. Events include naturalist-led hikes, owl pellet dissection, and crafts for the kids. Serious nature enthusiasts may be interested in renting the two-bedroom cabin within the preserve. Night owls can visit the Buffalo Astronomy Association Observatory at Beaver Meadow on the first Saturday evening of the month, April through October. More food specialties than the Buffalo Wing! Unless you thought that a Buffalo Wing was part of a bison, you’ve probably figured out by now that wings are named for the city in which they were created. 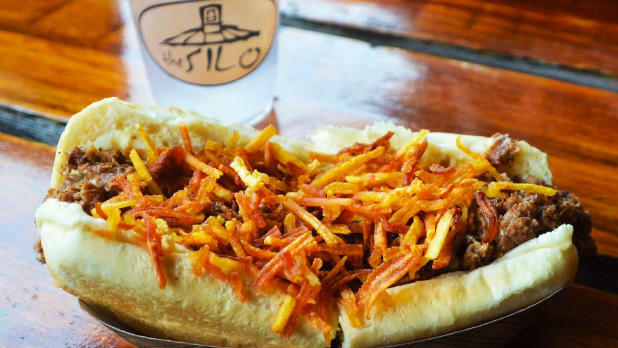 You have to try some while in town (follow the Buffalo Wing Trail), but also sample these other foods dreamed up in the Queen City. 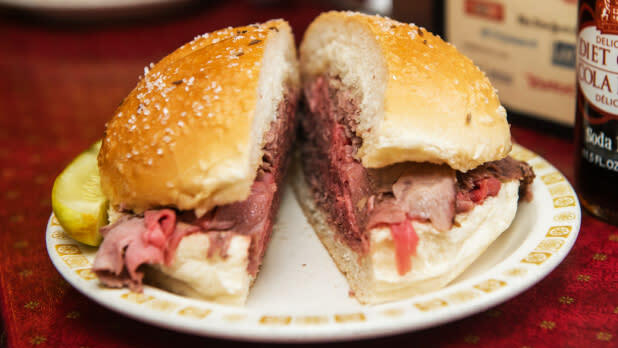 Try a beef on weck (pictured; rare, thinly cut roast beef and horseradish on a kimmelweck/kaiser roll, dipped in au jus) at Schwabl’s, a “steak in the grass” sandwich (steak + dandelion grass) at Dandelion’s, and a chicken finger sub at Jim’s Steakout. The region’s pizza trend is cup-and-char, which means topped with pepperonis that curl up on the edges to keep the juices in. Try a pie at Bocce Club Pizza. If you’re into sweets, you’ll find sponge candy (honeycomb toffee dipped in chocolate) at many spots around town, including locals’ favorites Aletheas, Ko-Ed, and Platter’s. The last remaining kazoo factory! In this era of all digital everything, introduce the kids to a battery-free, no-wifi-necessary toy that has been made in Eden, New York for more than a century. 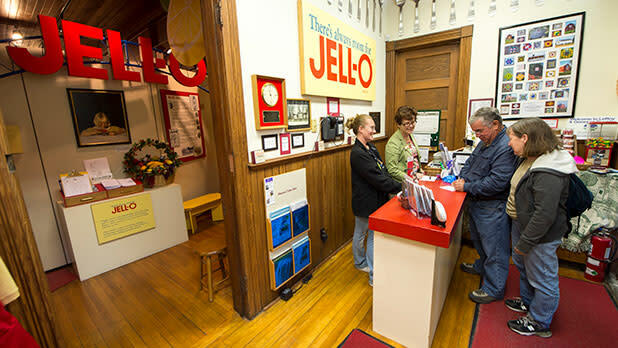 The Original Kazoo Company, Factory, Museum, and Gift Shop opened in 1916 and is the only remaining metal kazoo factory in North America. Learn the 18 steps of how kazoos were made back then—charmingly the same way they are made today! You’ll also learn interesting trivia and take a look at historical kazoos, including some made from liquor bottles to celebrate the end of Prohibition and others from wood, silver, and gold. 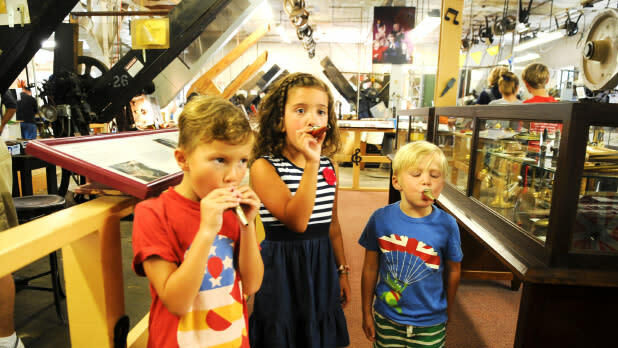 There’s even an opportunity to make your own kazoo, for a truly memorable souvenir. A fort in high demand! Old Fort Niagara long ago controlled access to the Great Lakes, which explains why it became a strategic hot potato for a procession of armies. The area was first used by the French (who established a post in 1679); then the British (who seized the fort during the French-Indian War in 1759); the United States (which gained control after the Revolutionary War); the British (again, taking it back in 1813); and then the United States (which took it back once and for all in 1815). Today, during special events, reenactors perform musket-firing and artisan demonstrations. Some weekends, you’ll find special military themes (like Civil War Artillery School or French-Indian War Encampment, recreating the siege of 1759) and archaeological digs. Don’t miss your chance to see an original flag on display from the War of 1812. A sweet taste of Americana!